You are here: Home > Climbing > Climbing Instruction > No Partner? No Problem. Have you ever been unable to find a top rope belay partner? We have a new solution for CRG members! “No Partner? 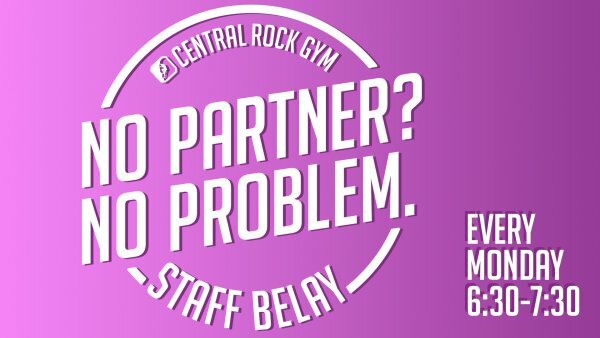 No Problem”, is an offering for belay certified climbers age 18+ to come in at select times to climb with a staff member and meet new climbing partners also in need of a buddy. Our staff will help belay for those who would like to get on rope climbs but don’t have a partner. We will also help you meet and partner up with other potential belayers and climbing partners. This is a great way to meet potential partners and develop an engagement with others in the community, while getting a couple climbs in at the same time! Look for the Staff in the Pink Shirt! Please be aware this is not a Staffed Climbing session and is not a private or instructional lesson.